The Southern star was produced by James Allen as a mid-week newspaper during his time as editor and owner of the South Australian register. Somewhat in self-promotion, the Register declared that the first issues of the new newspaper showed, "considerable political spirit and literary ability." (South Australian register 7 January 1843, p. 2) The newspaper is large;y a vehicle for a vehement and sustained attack by Allen on the young governor, George Grey. Each issue carried the quote from Shakespeare's Richard III referring to Lord Grey, "Think upon Grey and let thy soul despair." The young colony was in the midst of financial crisis, causing Grey extended the spending cuts that had begun under the previous governor, George Gawler. Many of Grey's actions were deserving of criticism but James Allen obviously hoped for Grey's removal from office. Allen even described a fictional "commission" ruling that Grey be removed, in such a way that many readers both in Adelaide and London must have wondered whether the event had actually taken place. (26 October 1842, p. 3-4) Eleven issues of the newspaper have survived. 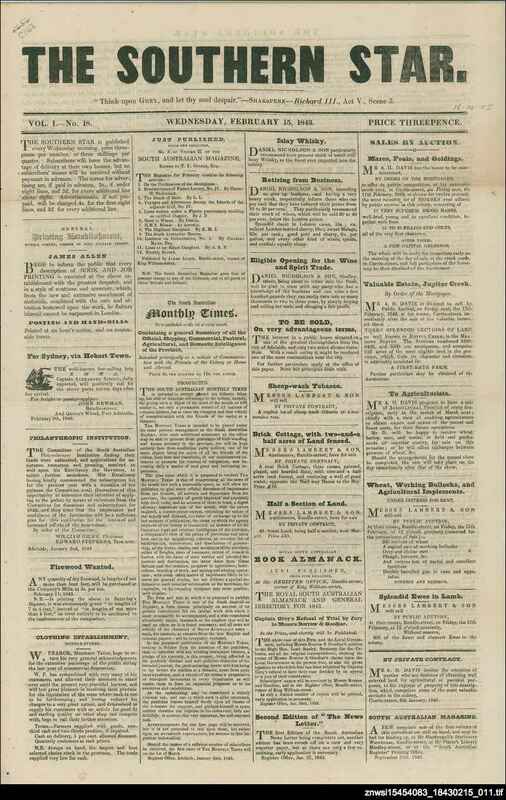 Apart from the focus on Grey, there are news items, including overseas news, and advertisements for other publications by James Allen, including his almanacks, and the South Australian magazine. There are also references to other early Adelaide newspapers in response to their criticism of Allen's various publications.